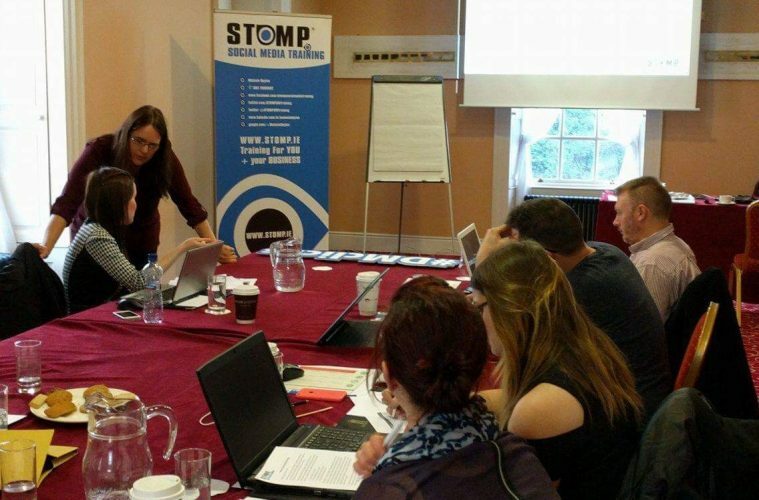 It’s been a couple of years since we last spoke, how has the STOMP Social Media Training been going since? It’s been a busy few years! I have had some amazing opportunities to work with some familiar names on TV and national press like Dr Eva Orsmond, whilst she was on Dancing with the Stars and I also had the pleasure of working with Daniel Ramamoorthy (IamDamRam) on a couple of projects as well. I have also built up my repertoire of managing business pages and have worked on restaurant and takeaway pages all the way through to artists and writers. I have also been doing a lot more speaking gigs and I sponsor a few events as well now. I have been mentoring other businesses for some time now as well. I am now based in Co Westmeath. When I initially set up I was based in Co Wicklow so have had to grow my network further since moving. I started up in 2013 after completing the Start Your Own Business course with Wicklow LEO. It was an excellent course and heavily subsidised. I would highly recommend their supports and training, certainly for startups. There have been a few these past few years. Obviously working with the lovely people above! I have also been a Speaker, Mentor and Sponsor of the Women’s Inspire Network for the past few years which has helped me grow my network and obviously gain a client base. I now have an office in the High Street in Mullingar which gives me more visibility and makes my clients feel more secure. I have spoken about social media to people online and in different countries which has been challenging and refreshing all at once. What type of people are you trying to attract to your service? The people who best benefit from my service would be people who would like a refresh of their knowledge and / or to build confidence managing their own social media. I prefer to empower the owner first before offering to take it off them. I found it takes a lot of the mystery and fear out of it for them. They can then keep me accountable and have a much better understanding of why I need the content I do and why I need it so frequently! My sincere hope is to either partner up with another similar business or employ someone in the next couple of years. I have every expectation of growing my business beyond my own time so in the long term, this is what I am looking forward to doing. More tech software than gadgets to be fair. I obviously couldn’t survive doing my job without my Apple iPhone. The amount of time spent on it would be enormous but other than that and my laptop everything I use would be software. If people would like to learn more about myself or my business then they need only visit www.stomp.ie and you can find where I am on social media, my email and my phone number. I also run regular public courses or you can arrange custom training for 121 or for groups as well. I also write a monthly Social Media Round Up blog that people can subscribe too. Read more about it here.